At the request of Gilbert, and knowing there are others interested in this as well i have started this thread for those who wish to collaborate on searching for and breeding peas that have higher rates of outcrossing than traditional varieties. For those who are familiar with Landrace or evolutionary breeding techniques you will know that having a large amount of genetic diversity can be desirable, especially when trying to combat things like climate, diseases, pests, etc. Having good genetic diversity can allow for selection and adaption of both biotic and abiotic stresses. Anyway, one idea is to use peas that have more open flowers. 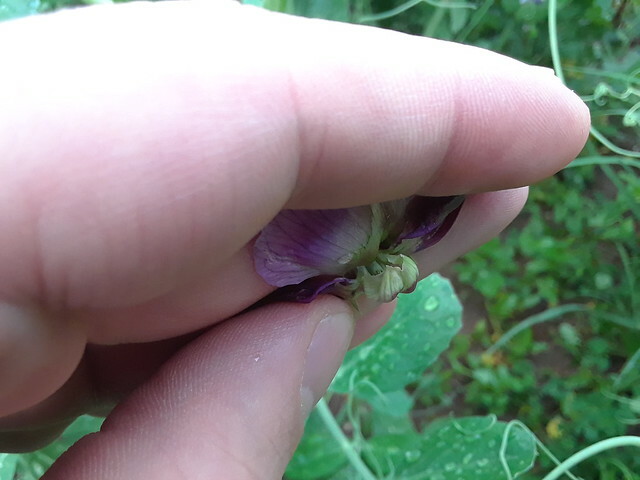 Traditional pea varieties seem to have a closed flower structure and a fused keel that makes it difficult for bees or other pollinators to even have access to pea pollen. Even varieties that have bright colored flowers will attract pollinators but often they then fly away. Some bees are known to bite into the flowers, but if the flowers were more open then higher outcrossing rates might occur. One downside is that these open flowers might be more vulnerable to dry conditions and may have decreased production. Still i think it is something worth working on anyway. My interest first came from Joseph who a few years back had suggested an interest in true landrace peas. I am told there is someone already working on this in secret and is close to releasing such a variety soon. That is all i know however. But i think i have two sources of germplasm that already may have high hopes for this project already. I will take a leap of faith that by sharing my ideas here openly that through collaborative plant breeding something really cool and useful may develop in this realm. I have found that by working together it is sometimes better than working alone and in secret. Sure one would like to keep things like this to themselves and say "look what i bred! ", but some projects are worth setting aside ones pride for the greater good. From what i gather this is a mutation that produces a few slight oddities, but nothing so terrible. The main side affect of this mutation that we are interested in is an open keel trait in most of the flowers (may be slightly environmentally affected), which obviously creates open access to pollen by bees. This variety has slightly elongated seedlings that look slightly odd and get rather tall very quickly, but not enough to cause anything serious. The seeds are sort of a mottled brown color with wrinkled seeds and is actually a decent snap pea too. I grew this variety last season and quite like it. I may have some seed i can share left and i have already shared some with a few people already. The NAP gene is recessive and on chromosome 1. Petals of keel broader and wing-like. Separate or only partly united, the keel is more or less open with anthers and pistil clearly showing. Here are a few photos of NAP gene flowers. This one is also recessive and on chromosome 5. This one may also have open flowers. I have a few seeds from this one, not enough to share at this point, so i reccomend you request your own samples from JIC, or the various gene banks like USDA GRIN, gatersleben, or the nordic seedbank. I have not had the chance to grow and evaluate this one yet. Abnormal flowers with high frequency of double keels, wings and standards. High frequency of double fused carpels in some backgrounds. Flowers open. open keels, but “delayed anther dehiscence”. Nicollas, over on Alan Bishop, has just posted about an outcrossing bean which achieves this, not by open keels, but “delayed anther dehiscence”. 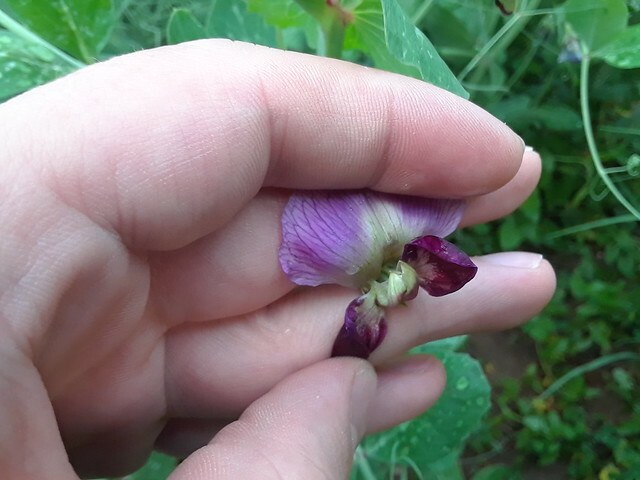 When I was doing hand pollination of pea flowers, I was startled that the flowers were shedding pollen long before the petals opened. The natural cross pollination rate in my garden is about 1 in 200, even with heavy predation of the flowers by pea weevils. Yeah, i thought about that yesterday. Pollen becomes viable very very early, so maybe something needed like the bean thread and delayed pollen would also help. Anyone know of such a trait in peas? Doing a quick search on jic produced this which sounds promising! Structurally sterile due to protruding pistil, petals not extending fully, carpels larger, styles shorter, filaments and petals crumpled. I assume these peas are only sterile if there are no other varieties around, in other words functionally self-incompatible rather that sterile? So if they were planted with ordinary peas, they'd cross with them. And any of the offspring that expressed these traits would cross with one another? I would guess that if they came with the liability of lower production due to low fertility, these traits would fade out of a landrace once they'd done their job. Is there a source for either of these? Now to read about it. I am assuming that because the stigma is exerted that means they never self pollinate and thus are "mechanically sterile". I take that to mean that manual self pollination and bee pollinations would work fine. This might be a novel trait for helping newbies try and cross pollinating peas. Since it is recessive, in a way it would disappear from the population but sometimes show back up. I think i will try to request some from the JIC if i can. Others can do the same. I've found the JIC to be really friendly with seed requests. Andrew, the links you posted don't lead me anywhere; it gives me a complicated search function which when searched leads to an error message. Also, I tried to go through the Pisum collection main page, but I couldn't figure out how one would find particular material and request it. Well, the JIC went a major website change after Mike Ambrose retired last year and half of their links are still broken. Plus they added this new anti spam thing for seemingly no reason. If you can get past the number thing come back and my links should work for the pgene database reference, but there is another place for the seed request thing. I'll try to find a link for that. It was hard for me to find it before when the website was good. But I'll try. A good old email might work better though. Yes this is the one. The link is a little hard to find and use. But useful if looking for specific numbers. I didn't find anything for mes2. Maybe time to email someone at jic. So i emailed them. This was the reply i got. I have just received a reply from my expert. The mes1 and mes2 mutations, although they are listed on pgene, there is no stock source mention, so we do not have any stock of this material in our seed store. We have ‘coch’ mutation traits, but 6 different variables. As these are mutations fertility is always an issue so we are only have small stocks. Hence we will only be able to give you about 3 seed of some lines. You are obviously aware of our Seedstor system so please order the lines you are interested in online. I was also given a reference of the various mutations that have been noted, lines of which we do not always stock.